I cannot believe what I did today. This is so not moi! I’m a lady, and I don’t want to die yet? 🙂 Ok, cut the drama Tigress! It’s just skydiving. What? Yes, I faced my fear people. I did it! But I would rather do an impromptu singing than break my back doing this. Kidding aside, I had a fantabulous time! You should have seen my face as I was putting on my skydiving jacket and helmet, I was not smiling at all. I had to go to the bathroom twice before the flight. But my rock was with me, my hubby! I had some friends with me too who also gave me their all out support. I was so nervous. But the moment I got inside with the instructor, I felt safe and relaxed (??? ), although I had to tell him not to take me up too high. He laughed. I started smiling actually and posed for the camera in the second round. The feeling of floating in the air, fly free like a bird, or simply being saved from jumping over a bridge. 🙂 You thought I was gonna be nostalgic about this, right? Well that is not moi! I can be but not in the mood for that right now. I am dizzy and I can’t sleep again. It was an awesome feeling! Now I feel jetlagged. 🙂 I feel like I just got off the plane after 15 hours straight flight from Asia. It’s weird feeling this way. Ok, it won’t be a novel for today. I just wanted to share this awesome experience tonight. 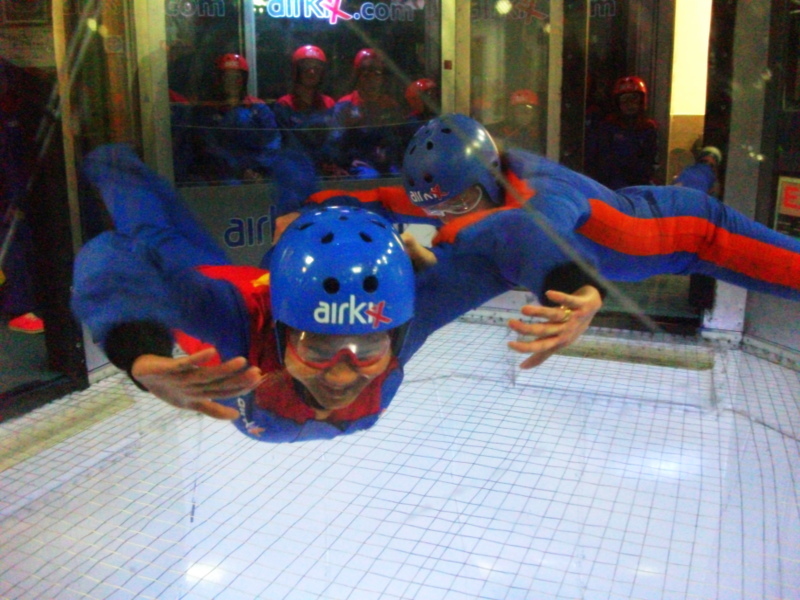 If you are in the UK, you can either do this in Milton Keynes or Manchester at Airkix Indoor Skydiving. It is amazing!